I haven’t even signed into my Netgalley since October. I’m too scared to see the damage I’ve done and I can’t bring myself to tackle it!! Well, if you do ever sign in again. I can understand it being really overwhelming, but taking it one step at a time really helps me. Well, I am hoping it is not as bad as you think. Glad you can find a bit pf guidance from my post. These are amazing tips I’ve started implementing myself. This one per month philosophy is most helpful! Great post! Thanks so much! Only requesting one a month really made a huge difference for me. I haven’t requested anything from Netgalley in a while. For several reasons: 1) It takes me forever to read ebooks because I’m not a huge fan of them, 2) I have unread books from a year ago 3) I get a lot of ARCs from work (the Joy’s of working at a bookstore) and 4) I need to focus on the 200+ book on my physical TBR which include ARCs. Those are all very good reasons, I can see why you don’t request from netgalley. With all of that I wouldn’t as well. Thanks for sharing! I would request more books, but for some reason YA seems to have a lot of ‘wish for it’ entries, so that helps cut down on requests lately! I was talking to a friend and I don’t think the ‘wish’ function works for me properly because they don’t show up on my shelf, I was randomly perusing the ‘read now’ category and saw a book I’d wished for had shown up there, but I didn’t get a notification! I can understand not being interested in the same books after so much time has passed. My reading tastes have changed very much from what I read 5 years ago. Very strange that it was not giving you a notification. I never did used the wish function so I can’t say if it works that way for me or not. Hopefully it gets fixed for you! Netgalley is SUCH a dangerous place. Especially if you first start out since you simply go on requesting sprees all the time, haha. I’ve always managed to stay on top of my ARC’s though. I guess that’s mainly because I was easily able to read three to four books a week? That’s changed by now, but still. It really can be dangerous, especially when starting. This that is exactly what I did. Sorry you have a higher chance of being denied for being international, it really does stink. I do hope more is available to you in the future. Oh well, in a way it’s convenient to keep things under control some more, but sometimes it’s simply frustrating to see friends getting approved left and right while I’m struggling all the time. 😛 Depends on my mood how I feel about it, haha. I’ve only recently been using NetGalley more as a book blogger. When I first started, I was overwhelming myself with all the ‘read now’ books because I wanted to get my feedback ratio up so I would be more likely to be accepted for requests, but I ended up reading books I hated and wanted to DNF, so I did. Ever since then, it’s been so much better for me. I don’t feel as stressed out. Some of my rules are the same as yours, like requesting one ARC a month, and I’m aiming to read them at least a month before so there’s no pressure to get a review out for the sake of getting it out. It’s made life so much easier and gives me more time for the books actually on my shelf. 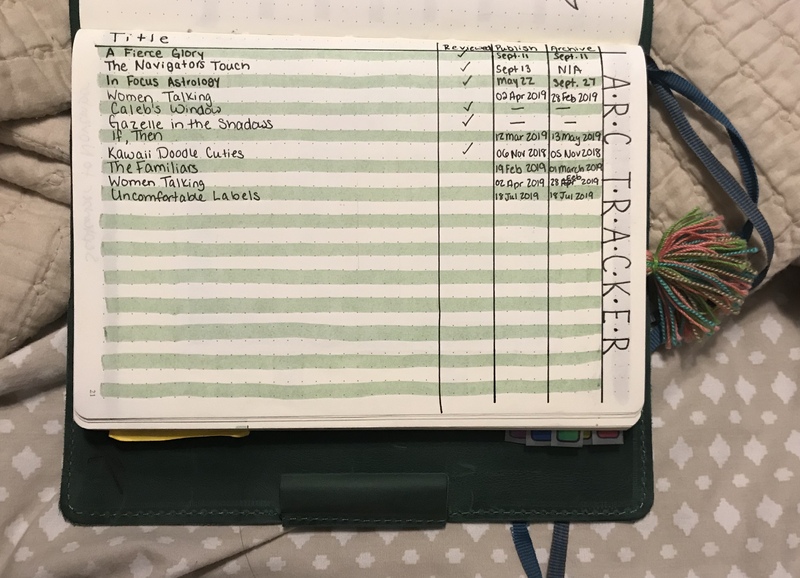 I love your tracker as well! I definitely need a way of keeping track of mine. Glad to hear how you manage your netgalley account. Funny how we have a few “rules” in common! The read now section is a hard one, it just calls you in to add a bunch to your shelf. Also, thanks for the complement on my tracker it really does help me because I don’t always want to get on the computer to check/plan my reading. I also try to not request everything at once! Did that in the beginning as well, and learned from my mistakes haha. Also I only request books I’m genuinely interested in! It seems like a very common mistake a lot of us have made. That is what happens when those who love books get the opportunity lol.